Let me just give a little bit of intuition for the problem and our solution, mainly as an excuse for showing some of the beautiful figures that Jon Shlens made. In B, the black cloud of points represent waveforms assigned to the first neuron (black trace in A), and the red cloud of points represent waveforms assigned to the second neuron (red trace in A). The blue arrow shows where you end up in PCA space if you add the mean black spike to the mean red spike. Crazy, huh? You end up way off in no-man’s land! Let me point out: this is actual data from an actual pair of retinal ganglion cells, recorded by Jon Shlens in EJ Chichilnisky‘s lab. See those little gray dots near the blue arrow? Those are projections of actual waveforms recorded during the experiment, which the clustering algorithm simply threw out. (Makes sense, given how far they are from both clusters, right?) Discarding these spikes is what produced the curious artifact in the cross-correlogram shown above. 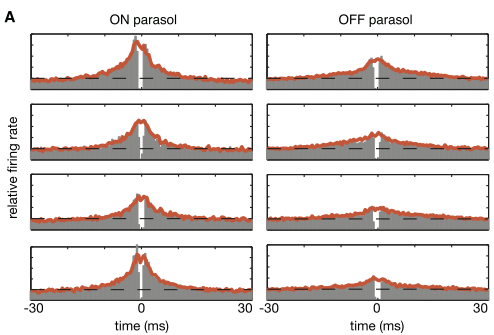 The good news is that we can address this problem using a generative model that incorporates superposition of spike waveforms. 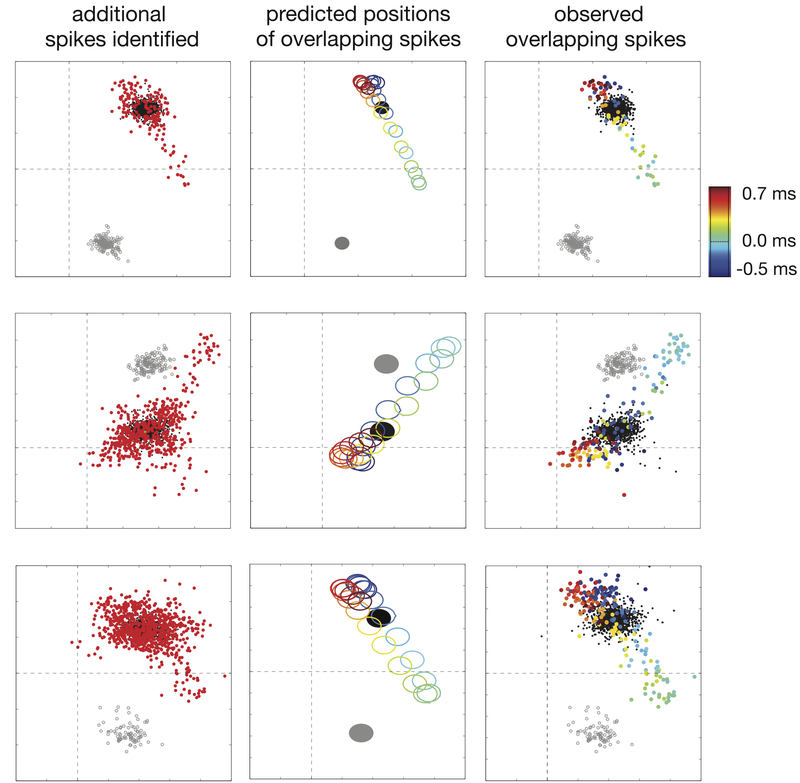 I won’t bore you with details here (read the paper if you like to be bored), but the basic idea is to use the clustering-based algorithm to identify the isolated spikes in the recording. Then, go through the recorded data and (greedily) insert spikes whenever doing so will reduce the residual error (essentially, whenever it looks like a particular spike should go there), with a sparse prior on spiking. This results in an (approximate) MAP estimate of the spike train. (We call it binary pursuit since it’s essentially a binary version of matching pursuit). Left: black dots: spikes detected by clustering; red dots: “missed” spikes. Middle: colored ellipses: where we’d expect points to be, as a function of time-shift of second spike (based on generative model). 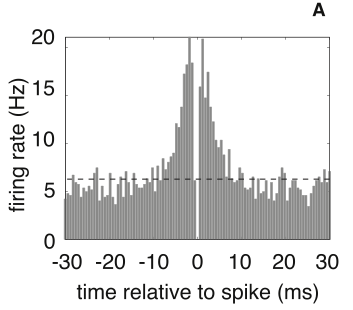 Right: overlapped spikes detected by binary pursuit (colored by time-shift). 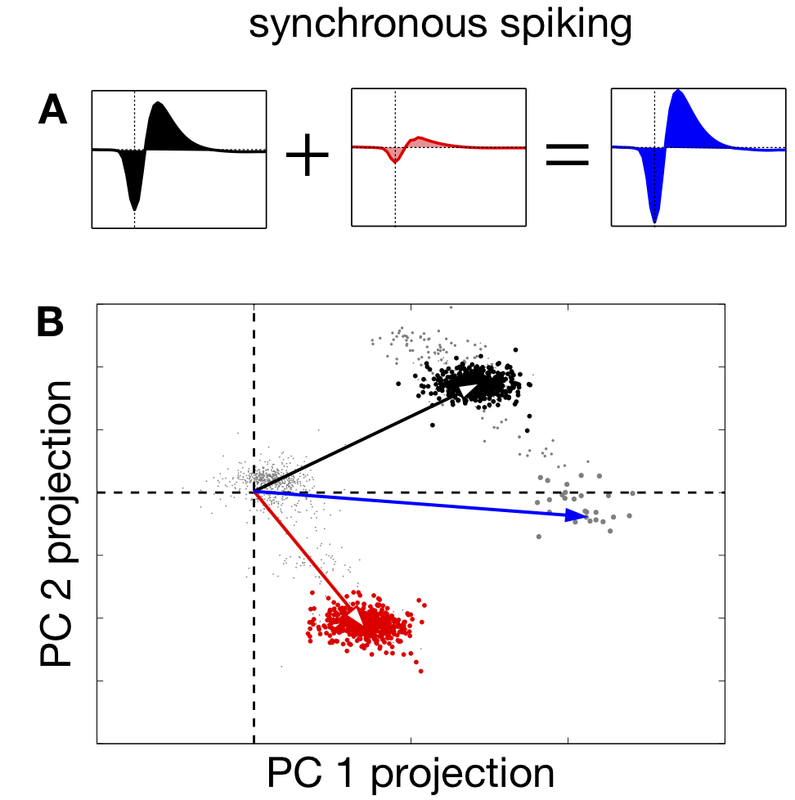 There’s lots of active work on this problem, and in my view it’s a great area for the development and application of Bayesian methods*, since we have a ton of prior information about spike trains and neural tissue and the statistical features of the recorded data, much of which has yet to be exploited. The challenge is to find computationally efficient inference methods, since the raw data is pretty big (512 electrodes sampled at 20KHz, for our dataset). * However, in my view, Frank Wood‘s utopian vision of a world in which neuroscientists don’t spike sort, but rather perform all analyses on multiple samples from the posterior over spike sortings, is still (thankfully) a very long ways off. This entry was posted in news and announcements and tagged correlations, spike sorting by jpillow. Bookmark the permalink.